Catan, (also know as Settlers of Catan) the legendary board game that you can spend countless hours playing over and over with your friends, is also available as an app. The app isn’t new, but I definitely believe it is an app worth reviewing. As sad as it sounds, every night while lying in bed waiting to go to sleep, I always play a game of Catan before I fall asleep, if that is any indication of how this review is going to go and how good this game is. The point of the game if you have never heard or played the game before, is to gain the most points and win. Duh right? 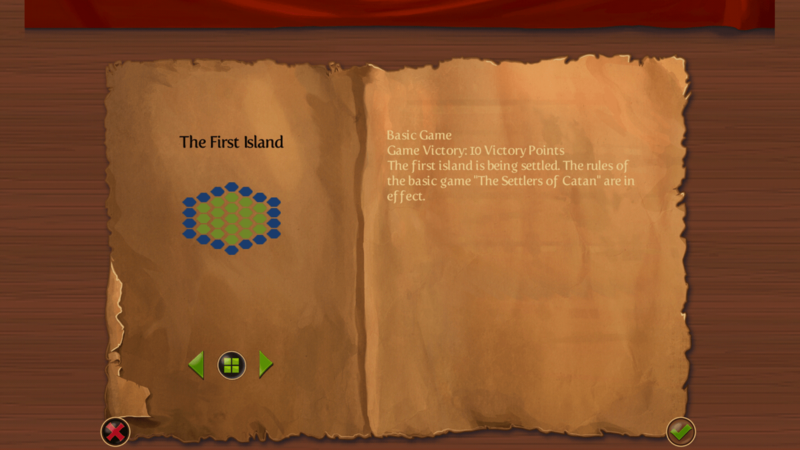 Here is a little bit more details on what Catan is about. You and your opponents represent settlers on the island of Catan. You build settlements and cities to gain resources and roads to connect them. 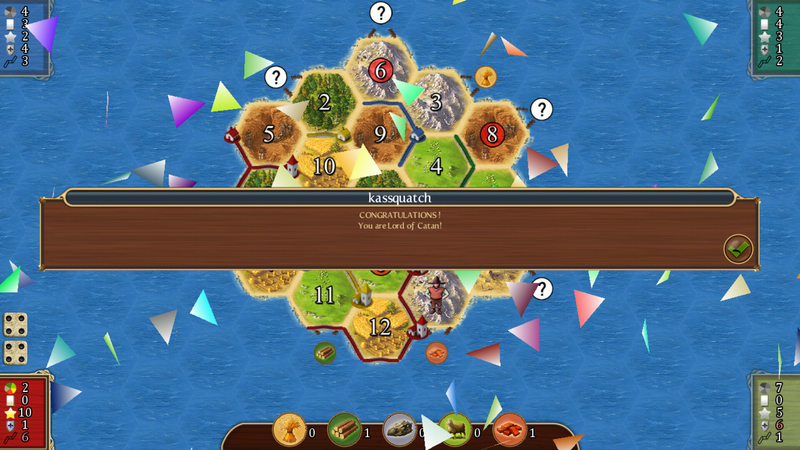 The gameboard consisted of hexagon tiles in that are the resources and a number on them in which when the dice are rolled, the matching number tile give you resources. You get 1 resources for every settlement touching that tile, and 2 for every city. Touching the tile means have a settlement or city on the corners of the tile as seen in the picture on the right. These tiles and numbers are randomly set every game, but can be set to a fixed layout in the options. You build your settlements, cities and roads by using your resources that you gain from rolling the dice. There are 5 different resource tiles. Brick, Lumber, Wool, Grain, and Ore. There is also a 6th tile which is the desert tile, which produces nothing and has no number on it. There is also a robber token, initially on the desert; if a player rolls 7, the robber must be moved to another hex, which will no longer produce resources until the robber is moved again; the player may also steal a resource card from another player. In addition, when a 7 is rolled, all players with more than 7 resource cards must discard half. However, the player gets to choose which half of their resource cards they must discard. Also, if a player has an odd number of cards over seven, such as 9, the player will round down when determining how many they will discard. 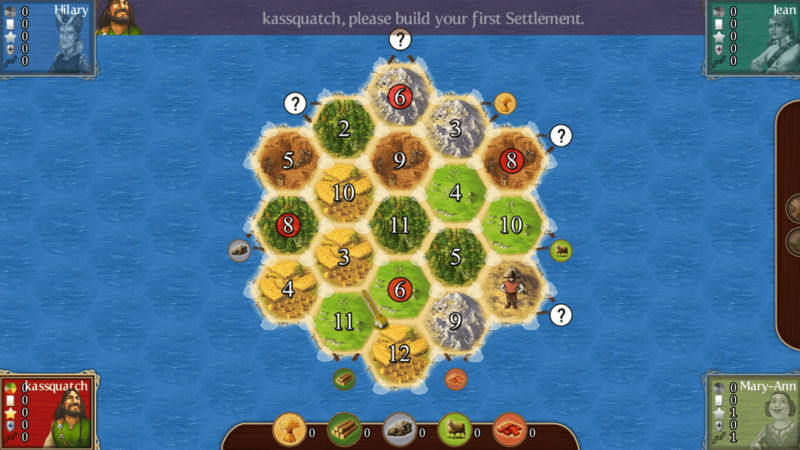 Players can trade resource cards among each other; players may also trade off-island (in effect, with the non-player bank) at a ratio of four of one resource for one of any other. By building settlements in certain spots on the edge of the board (ports), players may trade with the bank at three-to-one (3 of any single resource type) or two-to-one (two of a specific resource) ratios, determined by the port’s location. Resource cards can also be spent to buy a development card. Three types of development cards include cards worth one victory point; knight cards, which allow the player to move the robber as if they had rolled a 7; and a third set of cards which allow the player one of three abilities when played. The final goal of the game is to reach 10 victory points. Players score one point for each settlement they own and two for each city. Various other achievements, such as establishing the longest road and largest armies, grant a player additional victory points. There are also other variations of the game that come with expansions but I will only go through the base game. The other variations follow the same premise, just have different point totals and slightly different rules. 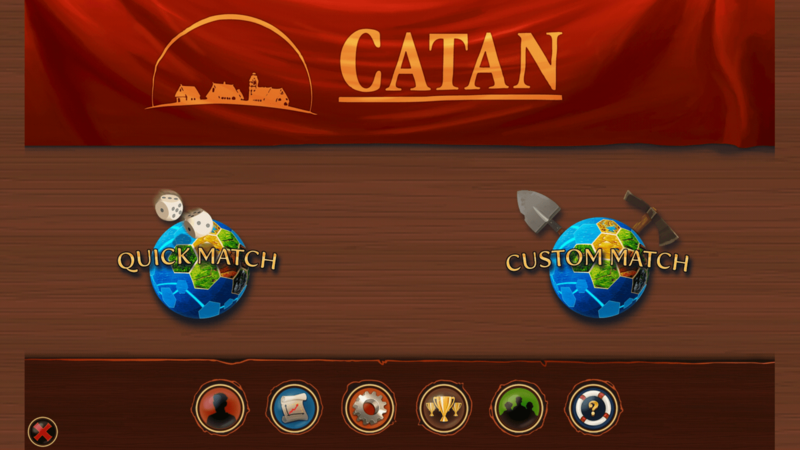 The Catan app is very easy to use. It comes in a regular definition form and a HD form for tablets and big phones like the Note 3. I do find that on my Note 3, the buttons on the HD Mode are a little hard to find the sweet spot on. In the year I have had the app, I have never had one crash on it. The app has all the options for the different game modes to set how you want to play since the board game has many variations of rules. There are also stats on your total game time, how many of each number has been rolled, and who is your favorite and least favorite player to play against based on your win/loss. In total with all the expansions (which cost additional money) there are 23 different games. Now if you include the different ways to change the options and rules, there are too many different game modes to count. Which is great. You can play a different style of game every time you play. The graphics in Catan and pretty simple but effective. There are 3 map packs you can choose from that give a different feel to each map. One is more realistic, one more cartoony, and one is a mix. I personally do not have a preference and switch mine up every once in a while to gain a fresh taste on the game. Like I said earlier, I play this every night. The menus flow nicely without any lag and the text is easy to read. The audio consists of background music and sound effects. There are no voice overs. There are sound effects for each resource that is gained and for each settlement/city/road that is built. I personally turn my audio off because I find them a little annoying. Settlements being built have a rooster effect, roads are clinks and clangs, wool resource is a sheep, grain is a “wind in the grass” sound, wood is the chopping of lumber, etc etc. The quality of them are crisp and clear and well done.The background music is a soothing kind of celtic medieval sound. The multiplayer mode came out recently and it has the same modes as singleplayer. You can choose a quick match or a custom match. Custom match is just where you decide what type of game you want to play, where quick match just finds you a seat and sends you in. There is minimal lag when playing, based on your internet connection that is. You have to register for an account before you play multiplayer and sadly to many people leave games and it gets ruined. This is no fault of the app, just the fault of people with no mind of other people. So don’t be one of those people. You ruin it for others. Have I said I play this game every night before I go to bed? It’s fun. Well that fun to me. I like a game that changes every time I play it. When you win, and you shall win, you get pretty confetti saying you are the lord of Catan! Hopefully you enjoy this game as much as I do. Do you own it? Tell me in the comments.